In those cases where the electrical impulse does not travel along the normal pathway or at the normal rate or rhythm, the pumping of the heart is disrupted. 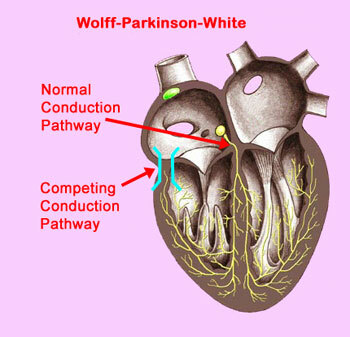 An example (diagram at left) is known as the Wolfe-Parkinson-White Accessory Connection. In this defect, the electrical impulse enters the right ventricle in two places rather than one, causing the potential for early activation of ventricular contractions. Electrophysiological defects that affect the heart include various forms of arrhythmia, or abnormal rates or rhythms of the beating of the heart. Examples include Tachycardia (the heart beats faster than normal), and Fibrillation (the rapid, chaotic beating of individual heart muscle fibers). Atrial flutter, is another form of tachycardia, in which the heart rate can be quite rapid.